Welcome in the New Year surrounded by London’s illuminations and fireworks on this 5-hour Thames River New Year’s Eve dinner cruise. Step aboard a comfortable cruise boat, and savor a delicious 4-course dinner as you glide by top London attractions such as the Houses of Parliament and Big Ben, all aglitter with floodlights. As midnight nears, take to the dance floor or watch the sights from deck. Then, when the clock strikes 12, toast the New Year with a glass of Champagne as you enjoy stellar views of London’s fireworks. Make your own way to the Tower Pier on the Thames River and step aboard your comfortable sightseeing boat. Be greeted by your onboard host, help yourself to an aperitif, and be shown to your reserved table in the inviting saloon. Enjoy the views of the Tower of London as your boat pulls away from dock, and drink in the occasion and setting as you cruise east toward Greenwich and back along the Thames to Westminster. Admire the passing landmarks such as Tower Bridge, the London Eye and the Houses of Parliament, all of them bathed in golden floodlights. Take snaps of Big Ben, with its illuminated clock showing the time as it ticks towards midnight. As you soak up the sights, sit down to a sumptuous 4-course dinner of classic British dishes, accompanied by a half-bottle of red or white wine. See the Itinerary below for a sample menu. 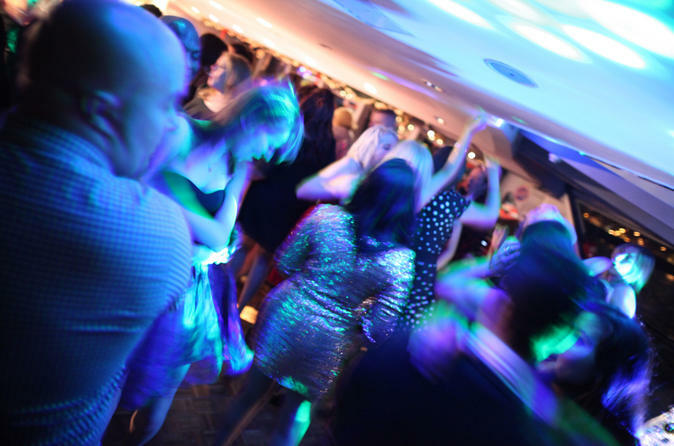 Afterward, perhaps take to the dance floor and celebrate New Year’s Eve by dancing to well-known pop hits played by the onboard DJ. Alternatively, take a turn on the outer deck to enjoy more of the sparkling city lights. Just before midnight, dock at Westminster Pier to count down to 12 and watch the spectacular annual fireworks display. Then, with the chimes of Big Ben ringing in your ears, raise an included glass of chilled Champagne to welcome in the New Year. After toasting the moment with your fellow guests, continue with the music and dancing until the early hours. Your cruise then finishes when you dock back at the start point.